“I feel like going back, but where will I go to, if I go back? I feel like staying here, but where will I stay if I stay? 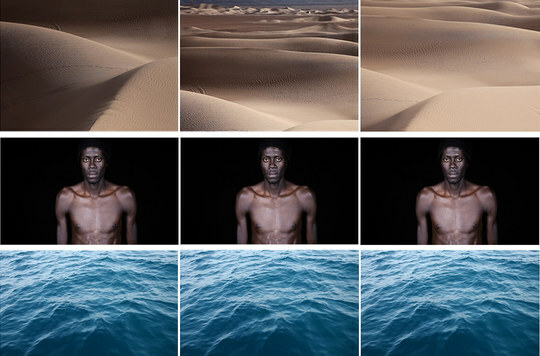 Resulting from months-long research in Morocco, where she met and interviewed number of migrants, the video installation of French Moroccan artist Leila Alaoui, evocatively titled Crossings, represents an homage to Sub-Saharan migrants and their perseverant journeys to reach safer locations. On Alaoui’s screens, backdrops transition from road markings to forest trees to desert landscapes to portraits of African men, women, and children facing the viewer. All of this to the voices of other disillusioned travellers, inevitably enveloping the viewer into a poignant narrative that clarifies the painful circumstances of their struggles to stay alive while hoping to reach their final destination.